We have visited Singapore three times in the last few years. It’s quite often used as a layover. I am not sure if the new world famous Changi Airport is helpful or not when it comes to overnight visitors. 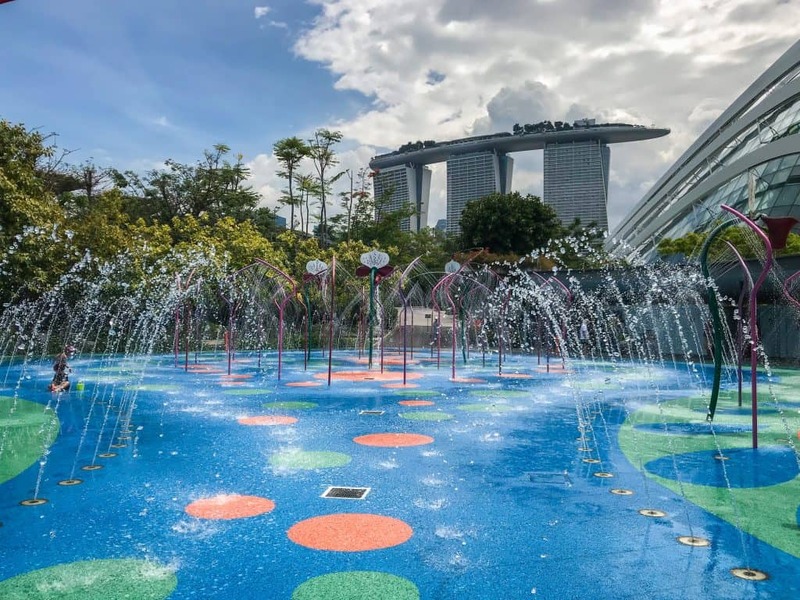 With all of the new features, such as butterfly farms, and giant waterfalls, visitors may be happy to stay within the Changi airport in transit. 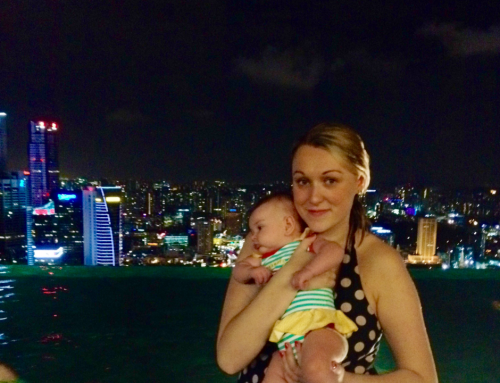 Singapore is such a fun place, and deserves more than a few days. 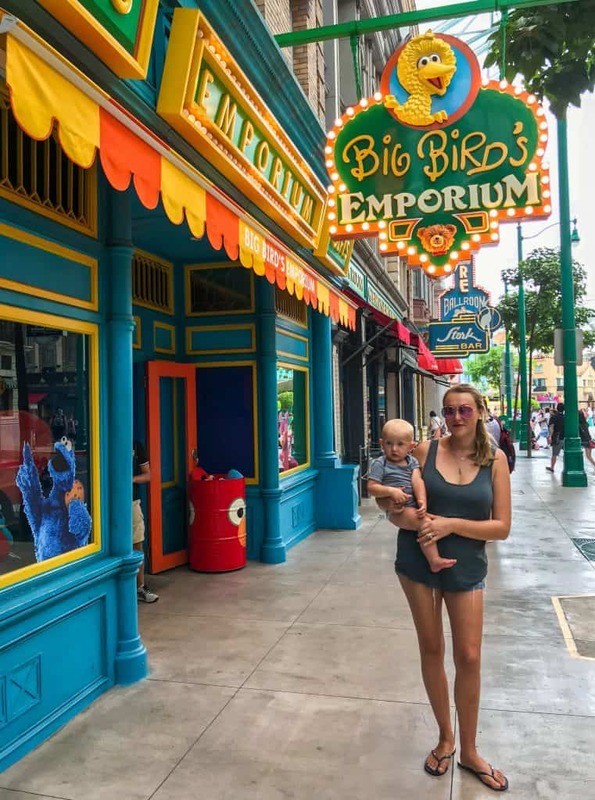 Even after eight nights on our third trip, there is still plenty of things to do in Singapore with kids that we have not yet experienced. 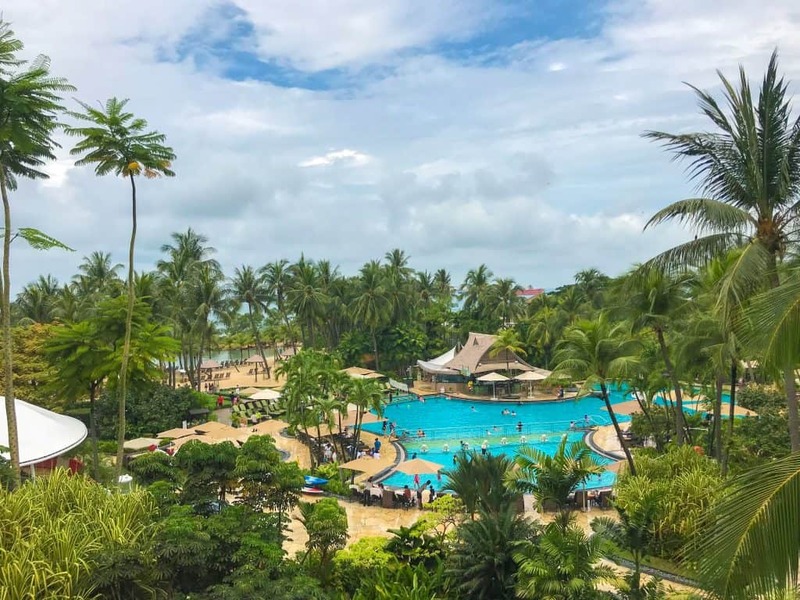 From the beautiful marina with its architectural wonders, to the adventure and fun island of Sentosa, it is most certainly a destination in its own right. The fusion of culture and high standards of living make it quite a different destination than neighbouring countries. Everything is about safety when it comes to children. For example when we visited a really nice indoor play area, they checked kids temperatures to ensure no one had fever. Most things have an age limitation. We are use to it of course from living in London, but after two months in Bali it was particularly obvious. Likewise, everyone speaks English in Singapore so its very helpful when it comes to communicating. Find the best flights with Singapore Airlines here! I have to be honest, I am not a theme park person. My hubby has been trying to get me into the idea of them for a long time. Our first encounter together was in Orlando, Florida and I came away hating them even more. The queues, the heat, the long walks, it was all too much with two little ones. I read that Universal at Resort World Sentosa was much better when it comes to size and queues, so, I said I’d give it a try. To my surprise, I have been completely converted and I had such great day. We all did; baby, dad and toddler included. Universal is quickly accessible from the car park. It doesn’t take ages like some other theme parks. You can be on a ride within a few minutes of parking your car. That makes a huge difference when it comes to grouchy and impatient kids. I found the queues to be quite small in the morning but they gradually built up throughout the day. That said, the unlimited express pass is only 52SGD or 25 GBP. For a queue free day, I think it’s more than worth purchasing. The park is split into 7 zones: Madagascar, Ancient Egypt, Hollywood, NY, Lost World, Sci Fi and Far Far Away! Each zone had something suitable for our toddler. She was just the right height for many of the rides and I must admit she loved NY the most. Probably because of Sesame St? Our baby was too little for the rides. I guess my only criticism, there is nothing for babies in terms of rides. However he did really enjoy all of the performances. So he definitely got something out of the day. Each zone has restrooms, restaurants and gift shops. There were plenty of options when it comes to food and it wasn’t as overpriced as other theme parks we’ve visited. They even had a Starbucks where we made a pitstop on the way home. We felt one day was enough time to see all of the highlights. There were only a few things we missed out on. The outdoor rides close when there is thunder or rain in the area for safety reasons. Its worth having a plan B and knowing exactly where the indoor rides are. That way you can head straight to them if it rains. We probably wasted a little bit of time trying to figure it out. 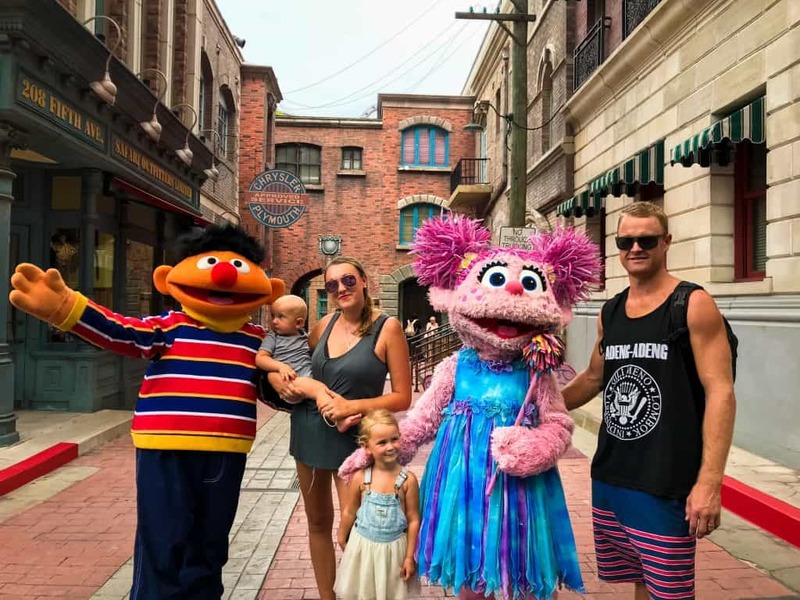 The other highlights for Esme were the Madagascar ride, the Donkey Show and the Sesame St Spaghetti Space ride. Whilst hubby absolutely loved the Sci-Fi rollercoaster. He is definitely a thrill seeker. I loved the lights, camera, action and revenge mummy. An all round family favourite was the incredible Waterworld theatrical performance. It featured an elaborate scene from the movie. 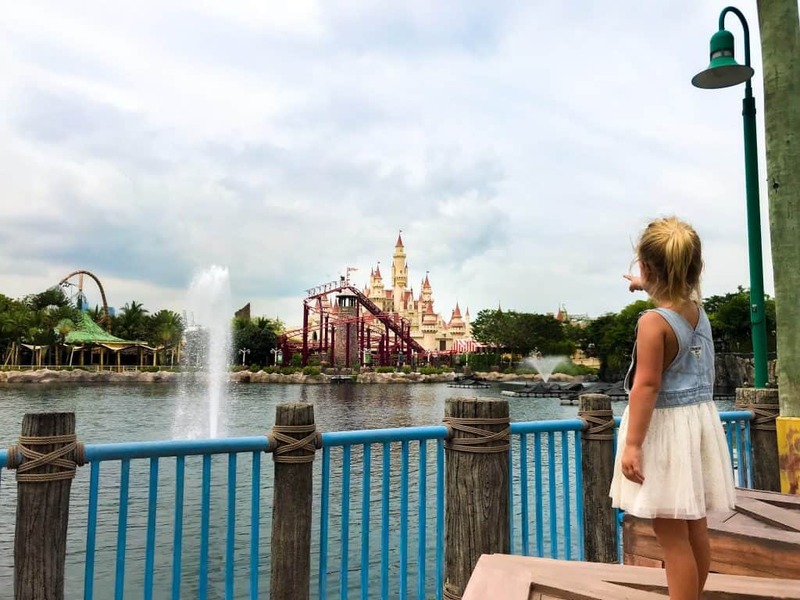 With jet skis, boats, gun fire, explosions and several heroic characters, it is not to be missed by anyone visiting Universal at Resort World Sentosa, Singapore! You might also want to check Discover Singapore in 24h. We visited the Aquarium at Resort World Sentosa on a rainy day. It was the perfect indoor activity with two little ones. There is quite an emphasis on educating visitors about ‘one use’ plastics. We really enjoyed that because its sometimes difficult to teach our daughter about it. We find she understands, but when an adult hands her a straw, she thinks it’s ok!. 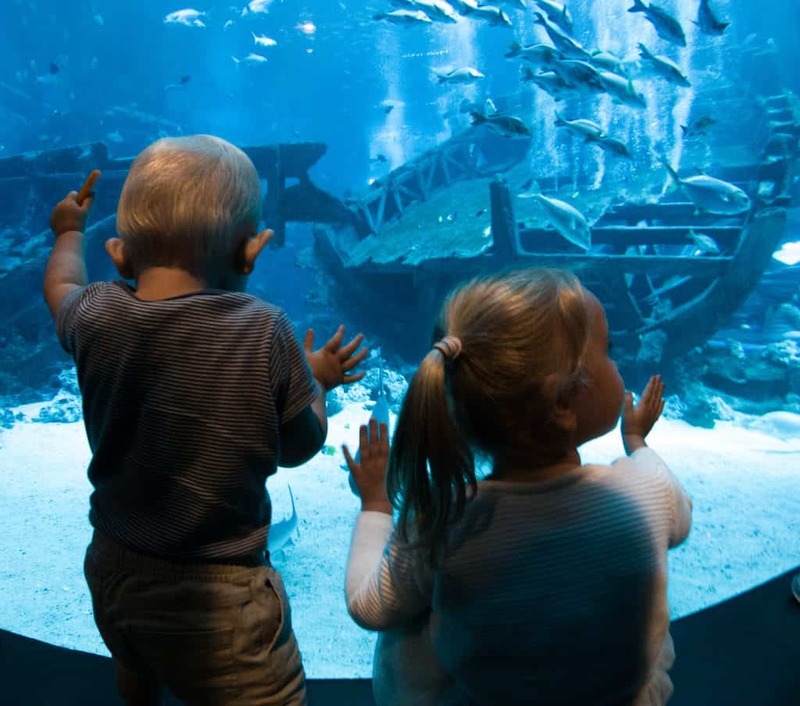 The way the education is designed at the aquarium is specific for young kids, which is fab. They had a wide variety of species and the size of the tanks were incredibly impressive. Gardens by the Bay has to be one of Singapore’s most iconic landmarks. The futuristic avatar like trees is a stand out feature. We visited with our daughter when she was a newborn. There was a storm at the time, so I was pleased we could re-visit on a nice day to see it in all its glory! There are several parts to the garden and all deserve some time. The incredible Cloud and Flower Forest are absolutely mind blowing. The two dome shaped conservatories are like a tropical wonderland. 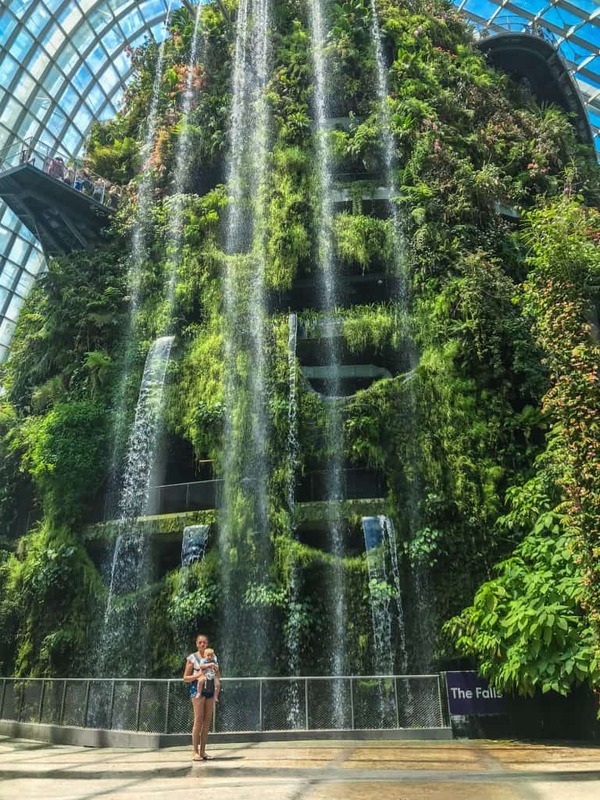 Filled with exotic plants, elaborate waterfalls, suspended walkways, and the most impressive glass architectural structure I have ever seen! It takes at least a couple of hours to walk around it with kids. Amongst the plants, little ones can spot beautiful and colourful sculptures from the sea. Fish, octopus and whales to name a few. My personal favourite sculpture was the one pictured below. How awesome is that? From nearly every angle of Gardens by the Bay, the iconic Marina Bay Sands can be seen. It’s the perfect back drop to complete a photograph, encapsulating Singapore in all its glory. After lunch in one of the nice cafes at Gardens by the Bay, we moved onto the incredible children’s splash park. It’s the first splash park I’ve ever been to that has good tunes playing for parents to enjoy, and one of the most extensive ones I’ve ever seen. Both of our kids had the best time crawling / running through the sprinklers. There is a smaller area for babies but our little boy loved the larger space just as much. Don’t forget your swimming togs if you are visiting! Next to the splash park there is also a toddlers playground and an adventure trail for older ones. I think the Singaporeans are often conservative with age limitations. It says 6 years old, but our daughter loved it with a little bit of help on some things. We loved how they’ve manipulated many of the bushes into perfect arches throughout the gardens. It definitely gave us a feeling of discovery and surprise. Especially coming across the treehouse! Esme, Shaun and I all tried the Mega Zip in Sentosa. At 450 metres long, zipping across jungle. beach and a tiny island, the views are super impressive. I loved the fact I could tandem zip with Esme. A lot of other places, she is not allowed because of her age and she’s often left disappointed. It’s all very safe (it’s Singapore) so we were very happy to be able to take her. We paid for our zip with our Sentosa Pass. It’s very good value for money and a wide range of attractions are available as part of the options. Luge, cable car, 3D experience and so on. 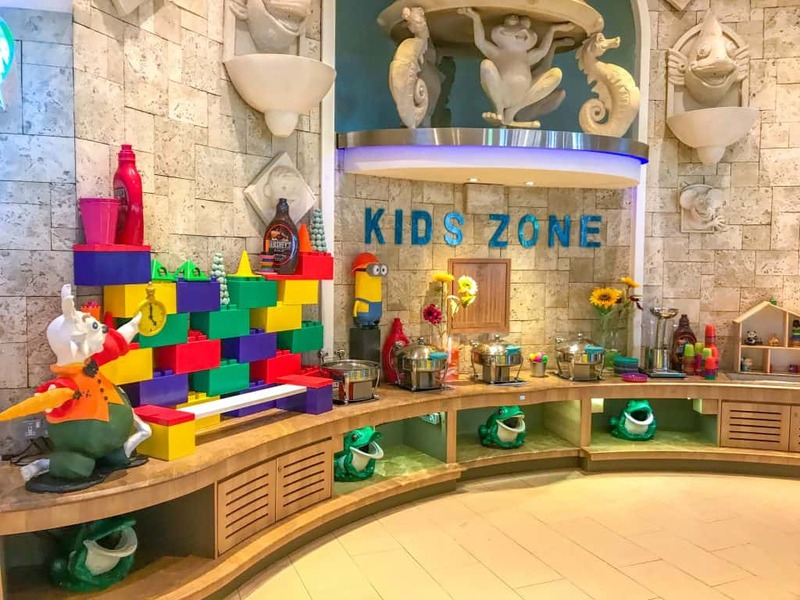 There are many KidZanias around the world, but the Singapore franchise was the first one we visited. Its most certainly a full day out and really it’s only suitable for children from four years old. We decided to split for this activity. Hubby relaxed at the hotel with baby, whilst I took our daughter. Neither of us had any idea what to expect. The helpful staff explained the whole concept on our arrival and it’s absolutely mind blowing. It takes a moment to get your head around it. Essentially it’s a fully functioning city, run by kids! It has everything imaginable. The experience starts at check-in, when we were given our tickets to ‘board’. On entering the city it definitely has a sense of entering another world, making the experience all the more real. Kids are given their own currency (kidzo’s) and a Maybank debit care that works inside the city. Both Esme and I had security tags, so if she did lose me, she couldn’t leave without me. Very clever and less of a worry! The entire concept is understanding the workings of an economy, to build independence and to boost confidence in their abilities. The staff are called ‘Zupervisors’ and are trained to support and tailor everything to a kid’s age. I found it all so interesting. Kids can check into an activity. So for example, our first stop was the Seven Eleven store. 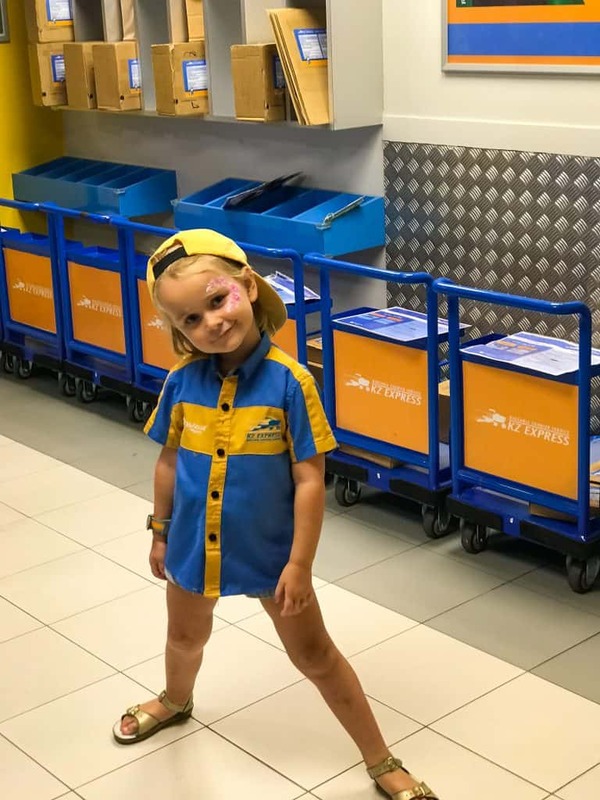 Esme could work as an attendant or be the customer. Parents wait outside but can watch from a distance. Parents are not allowed into most of the activities. I was surprised by this initially but having some time to think and reflect I could really see the benefits. Esme opted for the customer and she was given a shopping list. The store had all real stock in it. It’s one of her favourite role play games at home, so it was nice for her to do it in a relatively ‘real’ environment. That was just the tip of the iceberg. Throughout the day, she was also a fire fighter, a police officer, a pilot, a nurse, a DJ and so on. Everything was structured and an all round educational and insightful experience. 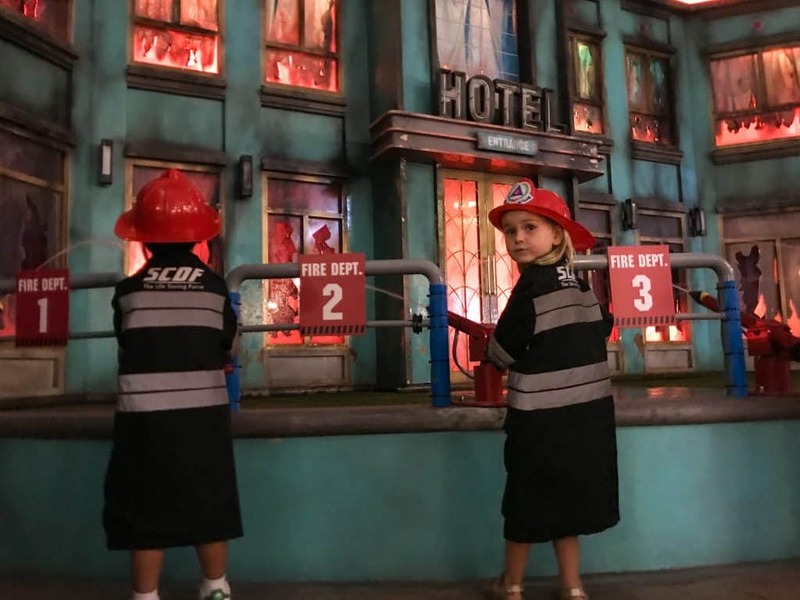 Visit the Kidzania website for tickets. We stayed in a few places around Singapore. Our first stop was at the fabulous and family friendly Furama Riverfront. Based in a great location of town to reach Sentosa within ten minutes, or the Marina with equal amount of time. It is a really big hotel so has lots going on. 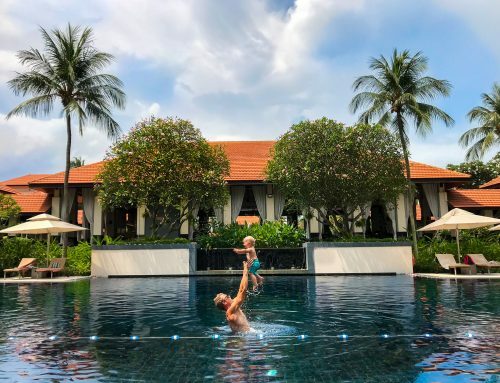 From afternoon tea in the Waterfall lounge, to inflatable water slides at the pool, everyone in our family was entertained. 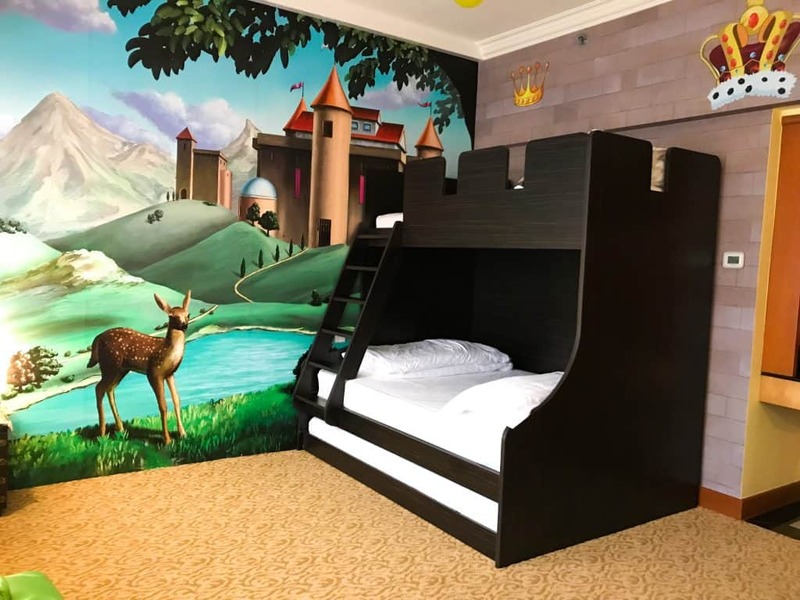 We had a themed bedroom, especially for the kids. The bed was like a castle with a special watch tower from the top. Our toddler loved climbing up and down. Within the room, we also had bean bags, kid sized table / chairs and a playstation. It was a perfect hangout for quiet time. The bathroom was kitted out with a stool for little ones, crocodile sticky bath mat and lots of kids’ toiletries. We were very happy the room is completely baby-proofed for our newly walking little one. All of the plugs are hidden behind secret hatches and the sharp corners of tables were covered with special caps. The swimming pool was quite big and also had a kids shallow area. Our toddler loved the blow up bouncy castle with slides and of course the inflatable unicorn. The sand pit was another win with our baby. Oh and the sensory experience of smelling all of the freshly growing herbs in the garden. They also had a mini-golf area behind the pool… and this is just around the swimming pool! In the lobby they also had an area called ‘Paws’. Complete with lots of toys, an igloo hut, blackboard and chalk; the kids were always keen to visit. 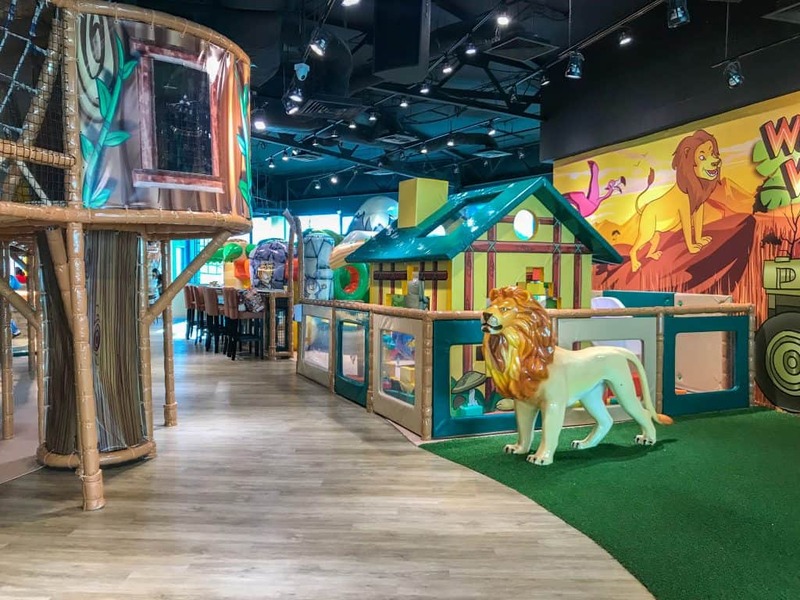 Waka Waka is a safari themed indoor play area connected to Furama Riverfront. 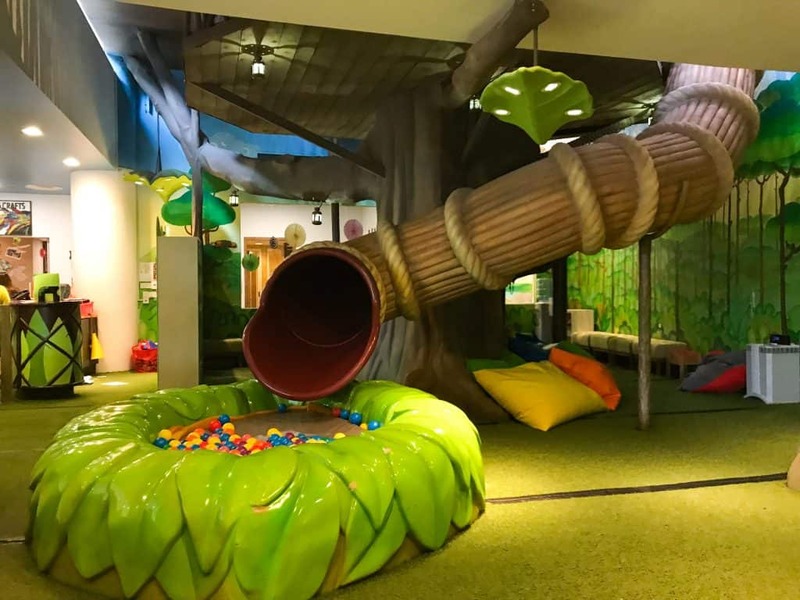 It’s a fantastic area and one of my all time favourite indoor play centres. It is absolutely miraculous when it comes to hygiene and it all looks brand new. Everyone has to wear socks, so don’t forget them if you are visiting. Our baby and toddler loved their afternoon hanging out at Waka Waka. It’s suitable for a wide age range. In the baby section there was a giant water bed, a wall with different cognitive games and a slide that had glitter and water inside. It was like an optical illusion! My husband was really impressed with the little house. He built the wall with our little man so he could knock it down. It sounds like a very simple feature but it was quite cool. The other part of Waka Waka features an elaborate obstacle course with giant volcanoes, tunnels and climbing frames for little ones to navigate. Guest can pay a little extra to do the more adventurous part with harness gear and ropes. It’s got a height limitation, so it’s probably only suitable for kids from about age 6. The Square Restaurant at Furama Riverfront is amazing. We had our breakfast and dinner there every day throughout our stay. I don’t ordinarily rate buffets highly but the food is incredible. They have something for all diets and preferences. The only downside is the quantity of food I consumed. Not good for getting the beach babe bod! They had lots of local options, like make your own Laksa and Singapore crab. Likewise there was plenty of vegetarian options for me. The breakfast was equally as impressive. Fresh fruits, pasties and cooked breakfast items to name a few. One of the most helpful things was having a ‘kid’s corner’. They have a mini table and chairs where little guests can dine together if they like. There were also toys to keep them entertained when us parents weren’t quite finished. Always useful instead of inhaling food before a melt down! We absolutely loved Furama Riverfront. It’s the ideal place for families. Although it can be expensive, there are budget options in Singapore. 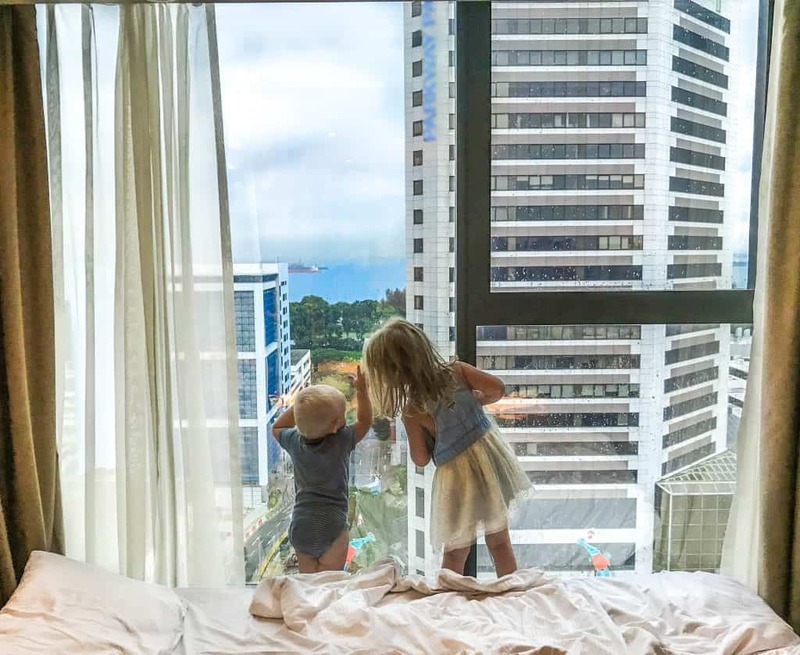 When it comes to budgeting for families, Grand Mercure Singapore Roxy is a highly rated yet affordable hotel in a good location. Based in historical Katong, the modern hotel is surrounded by the infamous Katong houses. Detailed and colourful architecture attracts the eyes of many tourists. Despite the attraction, the area feels somewhat more traditional. The array of restaurants is certainly a foodies paradise. From Korean, to Mexican there is something for all taste buds. The Grand Mercure Singapore Roxy is attached to a mall offering shelter to explore the area. It all seems to interconnect with bridges crossing roads making it easy to see, even when its raining. The hotel itself features several F&B outlets, from Chinese to Western food. The standout food for us was the clay pot dishes at Breeze Bistro. The food was amazing whilst soaking up the views of the swimming pool. Although this hotel had slightly less child specific features, it was an incredibly good price tag. 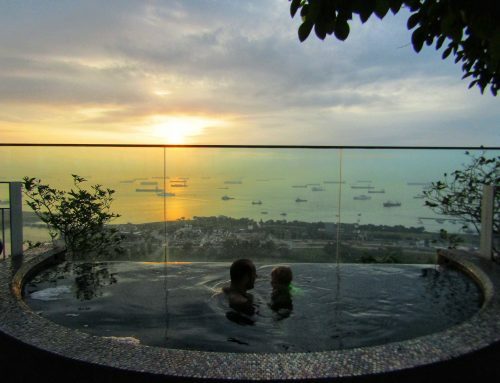 We spent our last two nights at the Shangri-La’s Rasa Sentosa Resort & Spa. 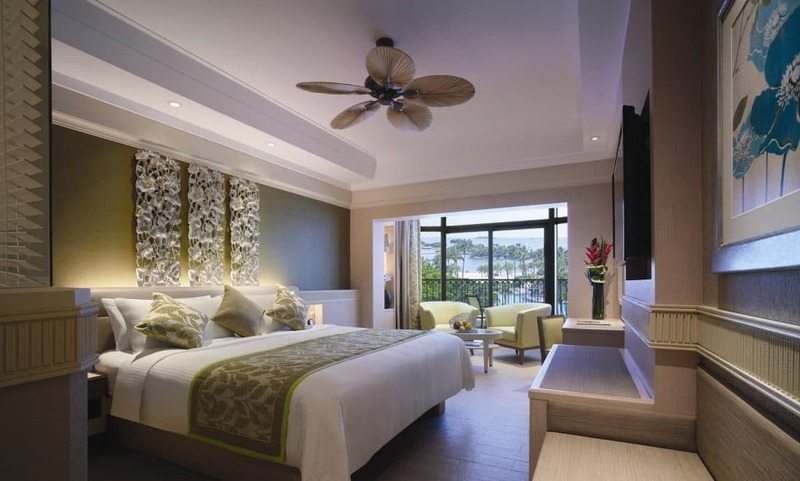 It’s Singapore’s only beachfront hotel, making it the ideal place to chill out. What an impressive building with over 450 rooms and six food and beverage outlets! It’s an incredibly family friendly resort. There are so many things for kids to do. 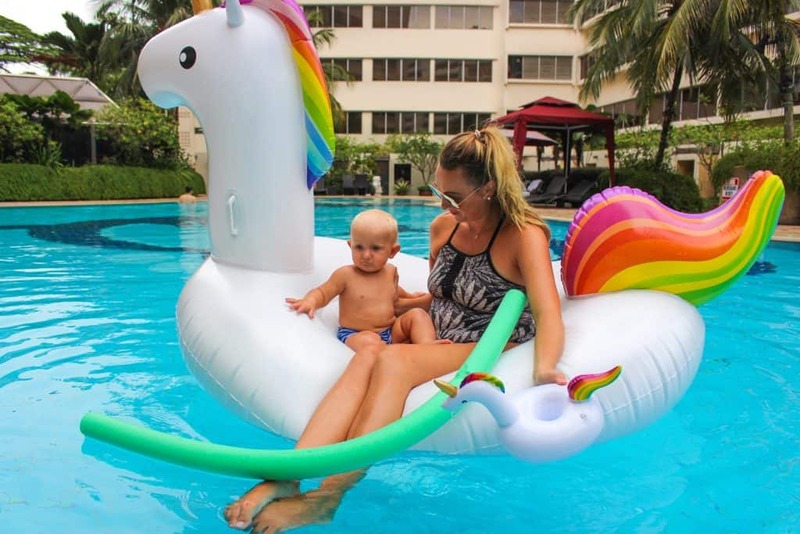 Featuring a large central swimming pool, with a shallow kid’s area, a splash park, as well as safari-themed water slides; our little ones loved playing in the water. Likewise, being right on the beach and maintained by the resort, the sand and water were really nice. There was plenty of shade with sun loungers and water sports. Guests could try SUP or kayaking, for example. The kids club on the third floor is also impressive. It’s separated into areas according to age. For example, the bigger area with a tree house, slides and a ball pit is for above 5 year olds. The other room is for younger children and is a little bit smaller. Activities take place throughout the day. For example, t-shirt tie dying looked fun. We had a fabulous room complete with a balcony where we spent our evenings when the kids were asleep. The room was spacious with a king double and a fold out sofa bed for our little one. Many of the rooms face into the central area. We could see the ocean, perfect at sunset. The other view is towards the gardens where a small waterfall can be seen. 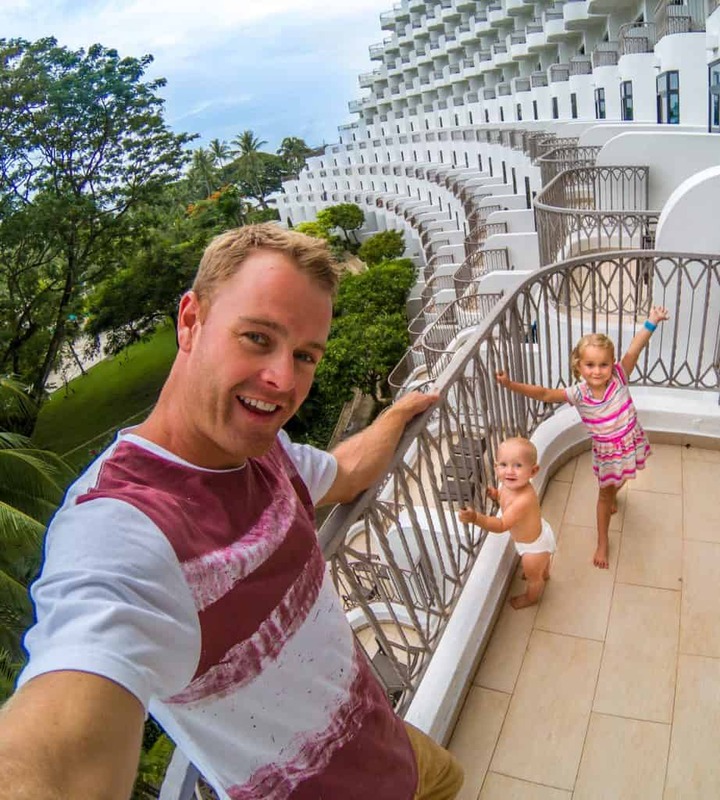 The resort offer a ‘family package‘. It includes a family room, breakfast and dinner buffet, as well as access to the kids club and usage of the water and sea-sport facilities. It seems like a really good deal to have most things included but have freedom to do things during the day, especially for lunch. There are plenty of places in the surrounding area to explore. That said, the food at the resort was an absolute highlight for all of us. It’s a complete foodie heaven! I don’t think many large resorts pull food off to the standard of fine dining, however, it was truly amazing. We had full tummies for our entire stay. The chefs are a focal point; wandering around at meals and checking in with guests for feedback. I loved chatting to them and taking recommendations of their specialities. 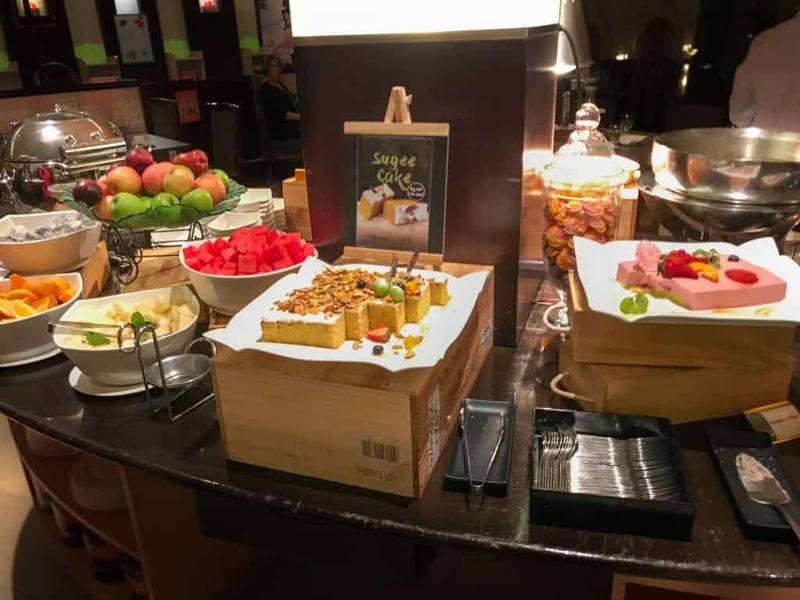 I can highly recommend the buffet dinner. The options are endless and like I say the quality is top notch. There were lots of Indian, Japanese, Italian, Chinese and Singaporean specialities. The Indian food was really our favourite. The paneer curry, the naan and poppadom were to die for! Our little girl was equally as impressed as us. Especially with her very own kid’s self service buffet! Everything was at her height, cutlery and crockery was safe for her to use by herself, so it was lovely for her to have independence. The staff were attentive and always provided paper and crayons at meals. 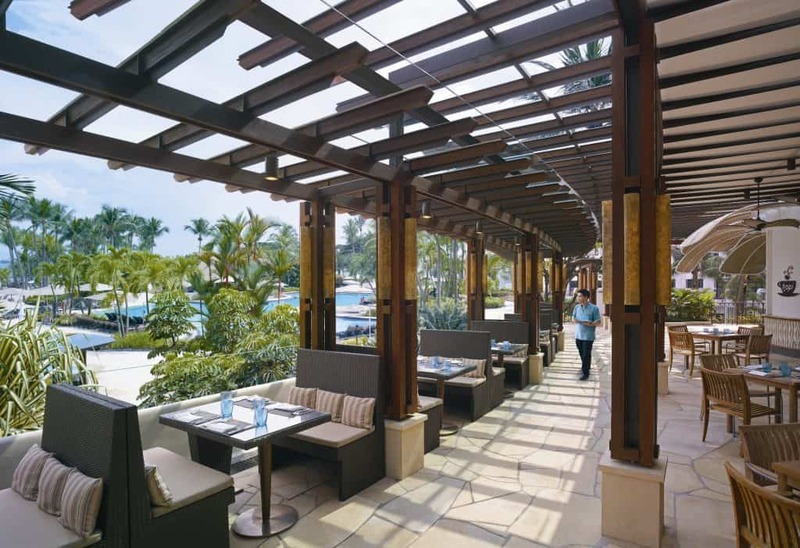 In case you don’t end up staying at the Shangri-La Rasa Sentosa Resort, they have a fabulous beachfront restaurant open to the public. Its all newly renovated and I have to say it is literally amazing for families and the food is banging! Lets start with the features for little ones! They have an awesome kid’s kitchen complete with play pretend food, crockery, cutlery and a chalk board with table and chairs for pretend guests. It’s a great way to keep them entertained whilst parents read the menu. They also have a mini splash area to keep them cool, as well as a dining table for their height. The best part of all in my opinion was the way the food is served. 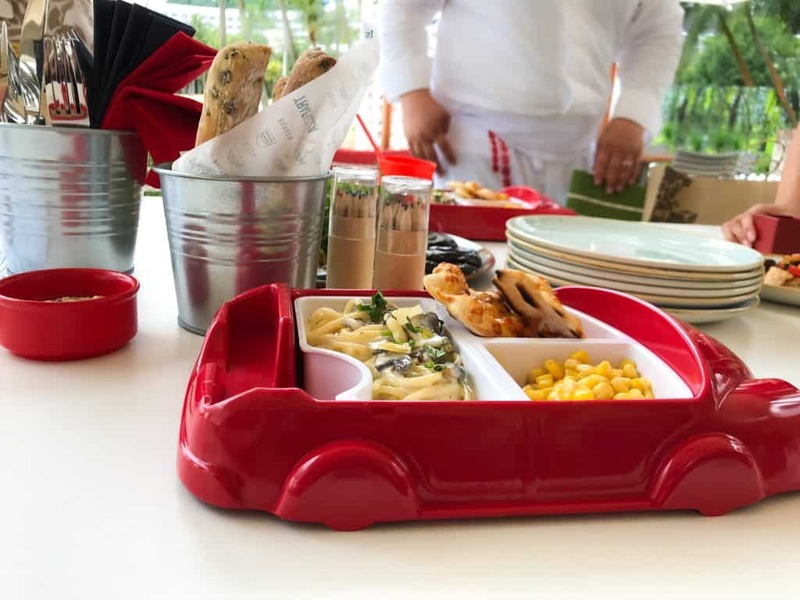 It is a clever bento box inside a red car. Complete with a few different nibbles, because lets face it, kids love little bits of everything. As for us parents, we tried the Mediterranean food platter. 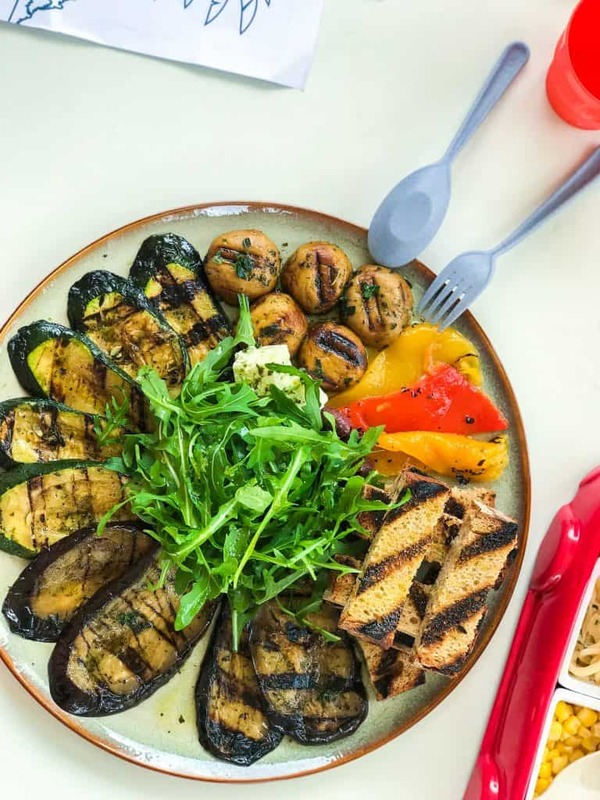 It had oodles of delicious grilled veg, olive oil, garlic cloves, feta cheese and fresh bread. It was so delicious. I still can’t believe we had that with a pizza and pasta chaser! Oh my goodness we were so full. Lucky enough we took it away for later. I cannot recommend Trapizza highly enough. Travelling long haul with kids can be a costly exercise. We are all about finding the most affordable, yet comfortable way of travelling. 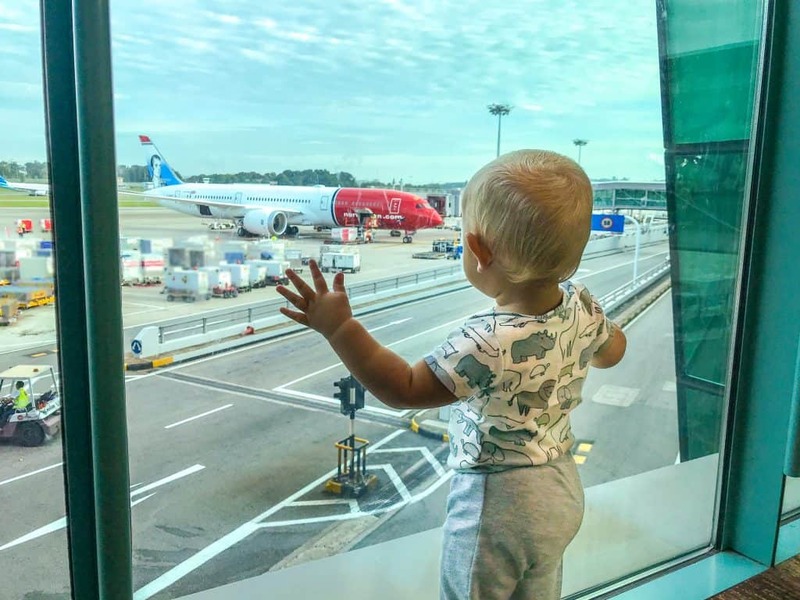 If you haven’t heard of Norwegian, they are an amazing low cost carrier that are now operating a number of long haul routes from London Gatwick. One of them is to Singapore! I love the fact this airline are making travelling so much more affordable for everyone, not just families. What we also love is the fact they have a premier cabin. The price is comparable to other airlines economy cabin. However the experience is somewhat like business class. 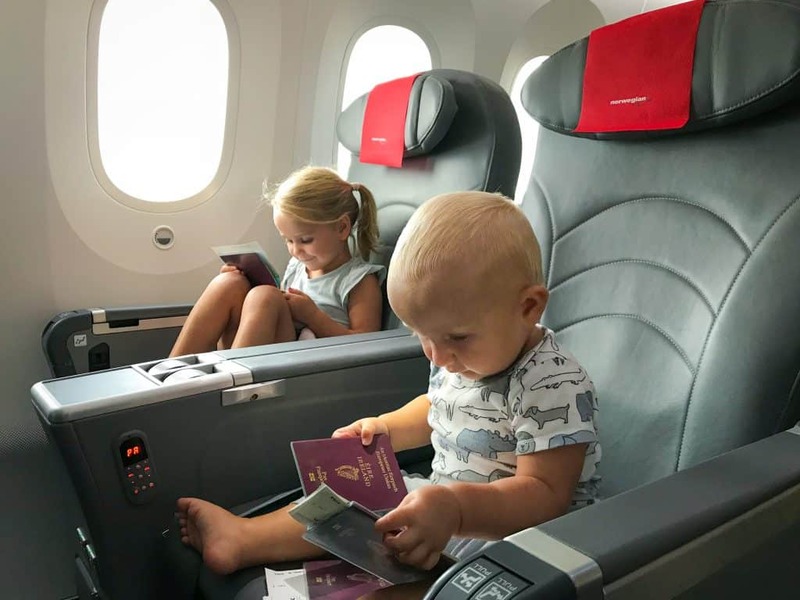 With lounge access, additional baggage allowance, express check-in and almost fully reclining seats, it makes the journey with little ones so much easier. Our daughter loved the variety of movies in the kids entertainment console. Not to mention the interactive map with animals from around the world. Anything that kills time on a day time flight with a toddler is a win. The food was really good and they also had kids meals which went down good with our little ones. Its just fab that there is a good low cost carrier flying to destinations such as Singapore nowadays. 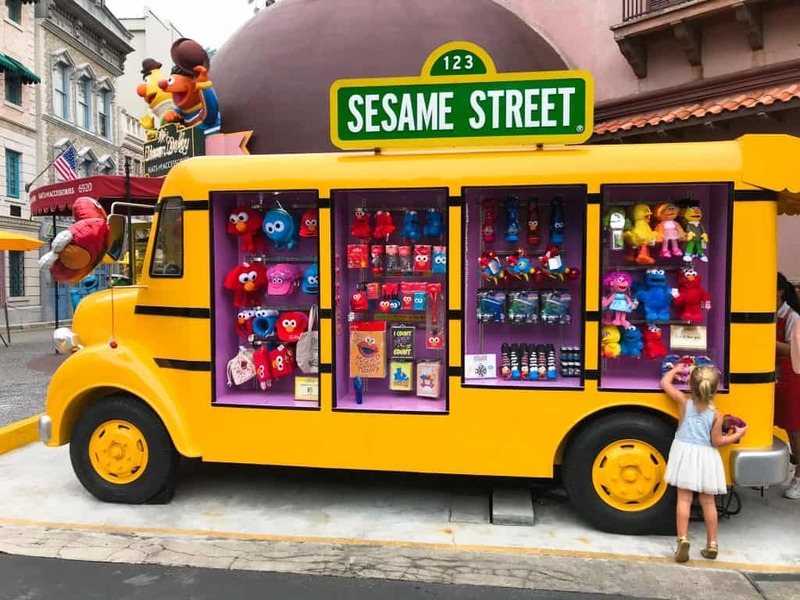 So as you can see there is so many fun things to do in Singapore with kids. From adventure activities, to incredible landmarks and family friendly resorts, there is something for all interests. Other than the occasional shower throughout the day, its pretty much the perfect place for a family trip. Sold on Singapore? Find flights on Singapore Airlines here! 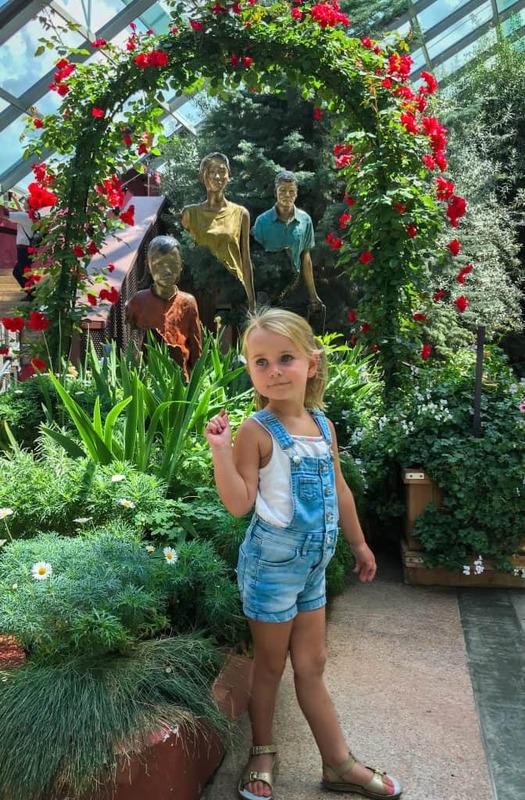 Have you found things to do in Singapore with kids helpful? Leave a comment, we would love to hear from you. If we’ve helped you in some way, we would love if you could help us too. In this digital age there is a demand for immediate information online. Being a patron is a new-age way of giving a small token of appreciation for this information, which takes time to put together, with no financial return. We offer exclusive access to blog posts before they are published as a thank you. We also offer travel advice and consultancy at different payment tiers. You can sign up to our Patron program here. If you prefer to make a small donation via PayPal you can also do so here. 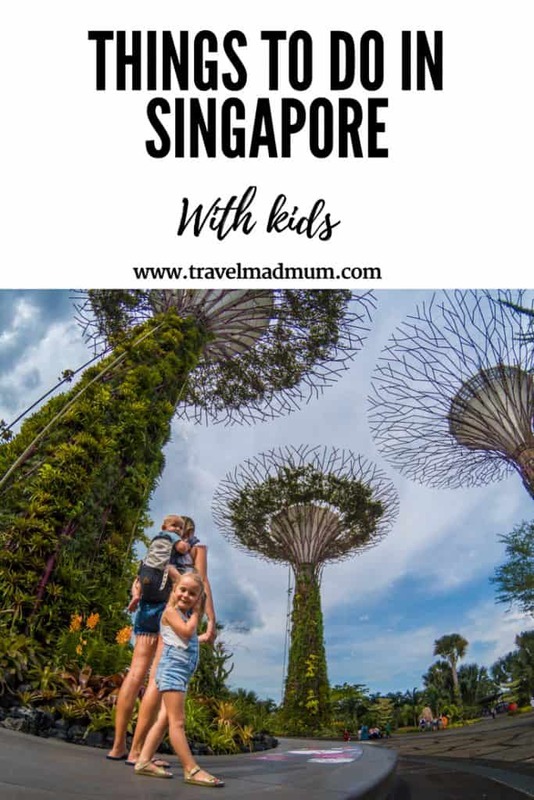 Disclaimer: This post things to do in Singapore with kids has affiliate links. Some of our stay was complimentary in return for an honest review. As always all views expressed are entirely my own. 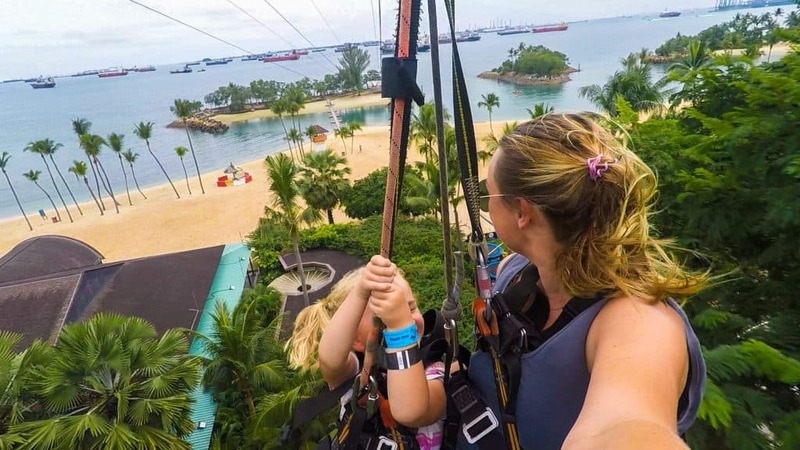 Looks like a fun family adventure in Singapore. Love the resort. Great views and services. I know you mentioned that you’ve gone several times, but in average, how many days do you stay? I am planning to go for 5 days, but not sure if that’s enough.